Just another thing, none of the links to your website work (here or PAA website). I use chrome as my browser, just in case its a browser issue. Yes, I am aware my Website is not working. It is on my “to do” list. Hi Alexis, thank you for your warm welcome on Saturday. Although I didn’t manage to get to grips with my painting, I did enjoy my time at the ranch. Hope we can paint there again sometime. 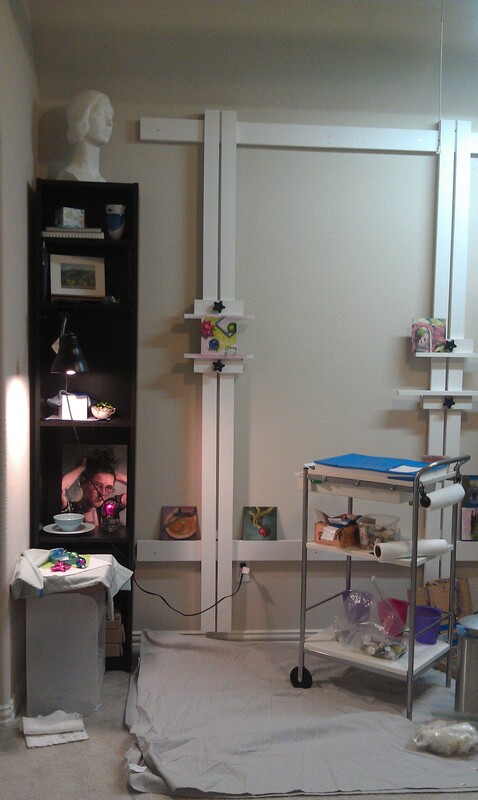 I have read with interest your blog posts on creating your perfect studio. I have a large room at the top of the house with lots of ‘hot’ light and was fairly comfortable with it until this year when I decided I wanted painting to be my focus. Over the years I have amassed an amazing amount of stuff as I have tried out various ways of expressing myself. Anyway, on my return from France in June, I decided I would sort out my studio, once and for all. Unlike you, I have not succeeded, its still a mess and its stopping me from doing anything. Of course a psychologist would claim this a classic avoidance response and they might be right but I need to take control now. Think I need to take a note out of your book and boxed up the extra stuff and remove it from sight. Just need a place to store it now. Too much to chuck and my daughter is always on the look out for craft supplies. One question, in one post you mention a light blocking drape at your window, what did you use? I don’t think we ever willing choose to chuck what we have gathered in the pursuit of our creative quest. I was forced to box up b/c we moved. I started further culling, only once I realized I could not fit it all in my new space. Not to mention struggling to work in the chaos. It forced me to establish better boundaries of what was do-able and what was not. I might suggest, Pick a corner. Box up the non-critical things into strategic (labeled) boxes. Move it to the garage or another room for a 3 weeks. This helps in 2 ways – 1) you find a bit more breathing space for working in your space. 2) You are able to begin prioritizing supplies and designated space. If you don’t go out there to retrieve it. It is less necessary to your current creative process. And the upside is it is already to pass on to someone whom can make use of the materials. No to mention choosing a directions to move forward from and spend more time on your creative process. As for a light blocking drape. I just found a standard “light blocking” drape or curtain from a local department store to fit the window. I chose something darker on the interior side to prevent any unwanted light from over-saturating my light balance.